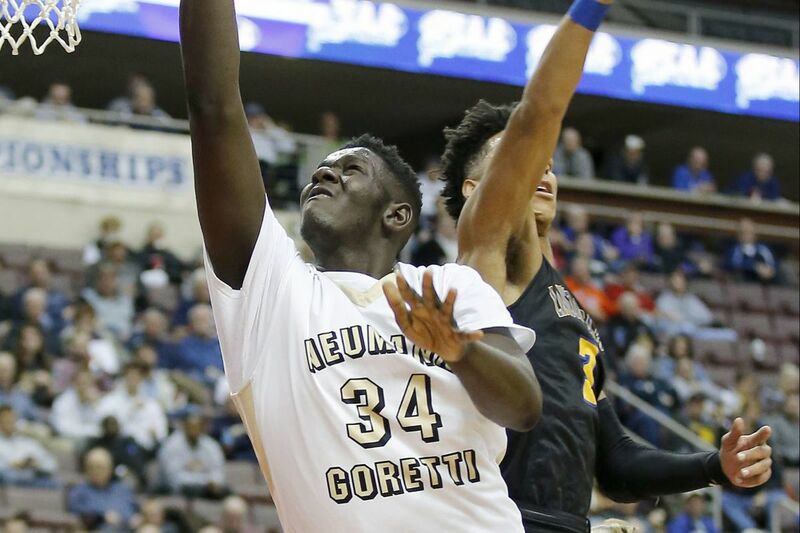 Neumann-Goretti’s Marcus Littles scored 12 points in Sunday’s overtime win over Father Judge. Pictured is Littles in last season’s PIAA AAA boys’ basketball championship on March 23, 2017 in Hershey. Chris Ings led a balanced attack Sunday as the Neumann-Goretti boys' basketball team edged Father Judge, 67-59, in overtime. Noah Warren had 14 points for the victors, while Marcus Littles and Dymir Montague pitched in with 12 points apiece. Andrew Funk scored a game-high 25 points as Archbishop Wood defeated Conwell-Egan, 78-65. Rahsool Diggins added 16 points for the Vikings. Wood outscored the Eagles by 16 in the third quarter. Allen Betrand shot 8-of-10 from the floor for 22 points in Roman Catholic's 64-46 triumph over Lansdale Catholic. Hakim Hart contributed 20 points and six rebounds for the Cahillites. Luke House finished with 16 points and eight rebounds to lead Archbishop Carroll past Bishop McDevitt, 72-53. AJ Hoggard added 14 points and five assists for the Patriots. Yochua Diaz recorded a double-double with 16 points and 11 rebounds as Dobbins topped Washington, 53-47. Jymir Thompson led the Mustangs with 19 points. Becca Margolis scored a game-high 26 points as Council Rock North beat Springside Chestnut Hill, 81-45. Dana Bandurick added 19 points for the victors. The Indians totaled 28 assists for the game. Mackenzie Gardler scored 12 points in Cardinal O'Hara's 55-38 victory over Life Center. Emily Helms had 11 points for the Lions. Kait Carter scored 16 points in Penn Charter's 48-38 win over Ursuline Academy. Carmen Williams added 15 points for the Quakers. Casey Remolde notched 16 points as St. Basil beat Archbishop Carroll, 31-26. Bella Pisella recorded nine points and eight assists as Episcopal Academy defeated Audenried, 60-36. Kaylie Griffin scored 16 points to lift Gwynedd-Mercy over Friends Select, 59-24. Catherine Polisano had 13 points and seven assists as Germantown Academy downed Bonner-Prendergast, 63-38. Jaye Haynes led the Friars with 15 points.